The Italians have always known a thing or two about speed and performance. Ferrari. Lamborghini. Ducati. These illustrious Italian brands are practically the definition of performance. 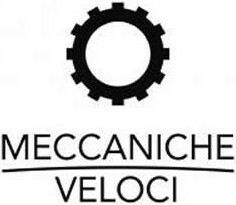 Now, there’s a new high performance Italian on the scene: Meccaniche Veloci. This luxury watchmaker found the inspiration for their latest collection in their own country’s racing heritage. 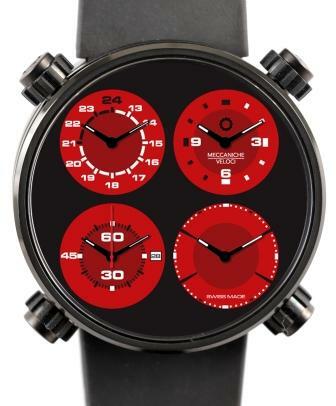 The new Meccaniche Veloci Quattro Valvole, introduced at Baselworld 2011, is a masterpiece of Italian engineering. 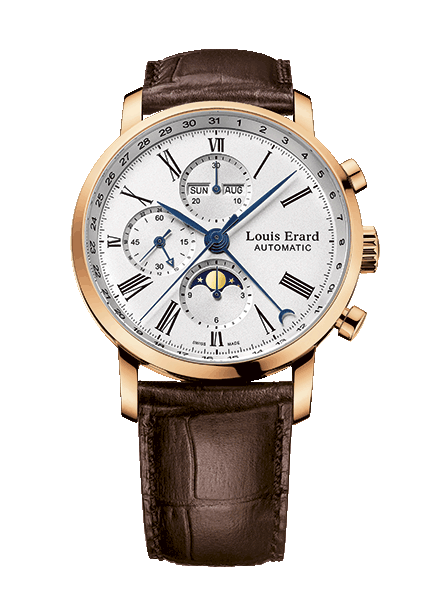 This spectacular watch takes its name from the four-valve racing engines that powered the classic 308 GTB/GTS Quattrovalvole – named for the four-valve cylinder heads that the Maranello-based automaker pioneered. The Quattro Valvole case is created using the same hardening process used in the production of high performance engines. 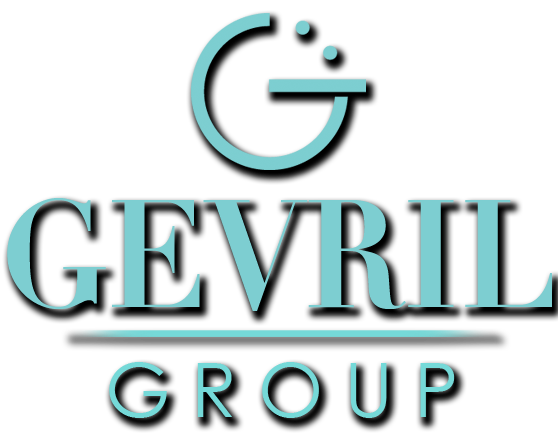 A solid aluminum or titanium billet is turned on a lathe in order to produce four cavities in which four separate movements are placed. 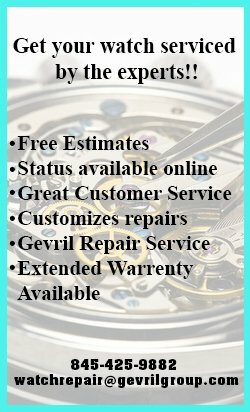 Each of these precise ETA 2671 mechanical automatic movements is completely independent. 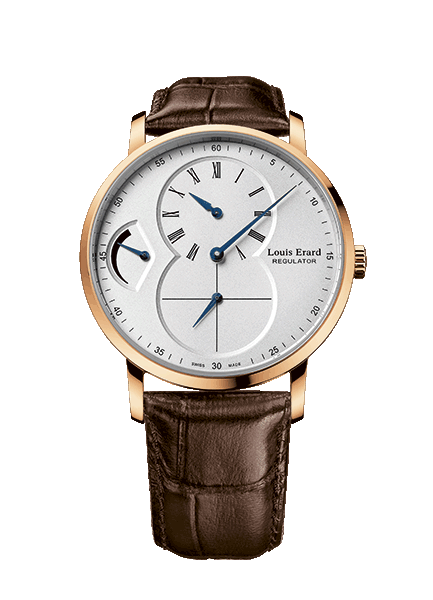 The result is a watch that can monitor four different time zones at once, or be used to track a variety of different racing or yachting events. The Quattro Valvole is as big and bold as the racing engines its unique design evokes. 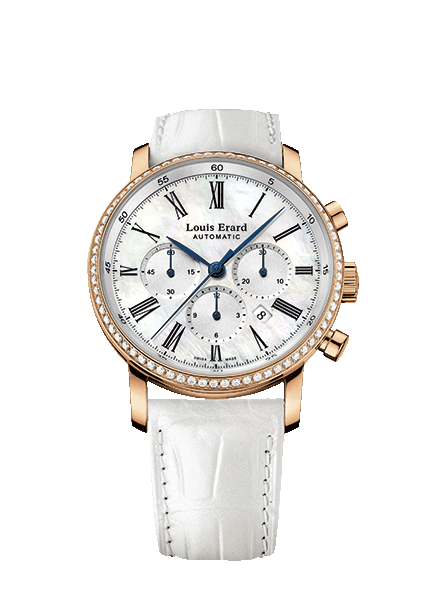 The massive 48mm case is available in an aircraft grade 7075 aluminum alloy, as well as titanium, carbon fiber, carboceramic material and even solid gold encrusted with diamonds. 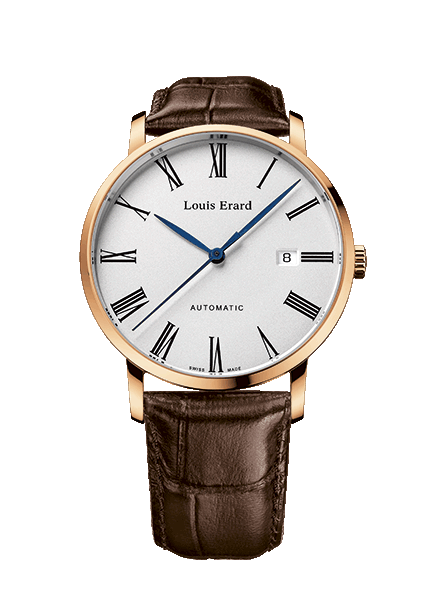 This case is equipped with a titanium crown for each of the four independent movements. 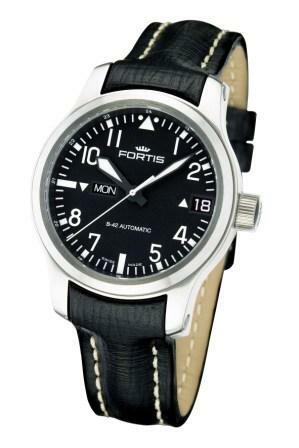 Only the finest materials are used for straps, which are attached to the case by four titanium screws. 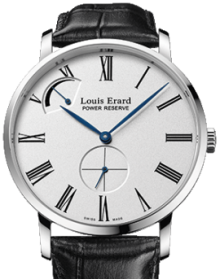 The watch features a sapphire, anti-reflective crystal and is water resistant to a depth of 10 meters. 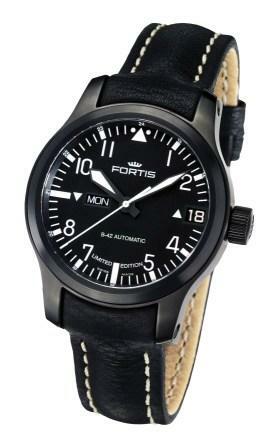 You can wear the watch with either a traditional tongue buckle or a special titanium deployment clasp and the unique four time zone dial is available in several colors to suit your own personal taste. 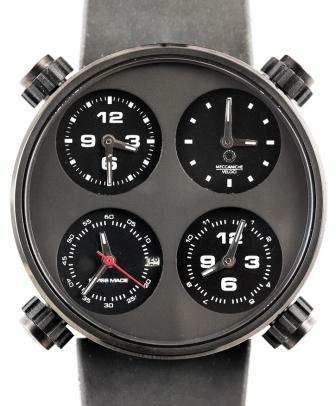 This bold, masculine watch isn’t for everybody, but neither is a Ferrari. If you are interested in acquiring one of these spectacular watches for yourself, contact your Meccaniche Veloci dealer immediately and reserve your Quattro Valvole today. 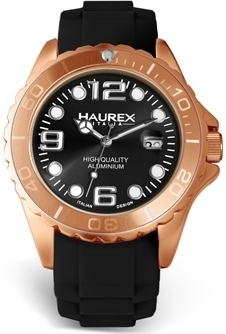 Haurex Italia is an Italian watch brand which, since its foundation in 1989, has aimed to produce high quality wrist watches with innovative design and materials that are always in line with fashion trends. Through its timepieces, Haurex aims to meet the world’s growing demand for Italian fashion and design. In order to achieve the desired result, Haurex has set up a design group in Italy that searches for innovations — at 360° — and that keeps up-to-date with the newest materials being used in other fashion sectors. The Haurex interpretation of the watch is that of an accessory which should always be up to date in every single aspect including lines, colors and materials but never taken to such an extreme that it becomes a short-lived fad. 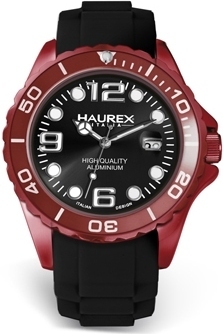 The new Haurex INK collections announced at Baselworld 2011 employ mixtures of aluminum and rubber permitting nearly unlimited color variations. This union between Italian design, competitive prices and quality materials has permitted Haurex to succeed in diverse markets. Today, Haurex is distributed through 700 points of sale within Italy and in more than 40 countries worldwide.